Although anterior shoulder instability is fairly common, not every case of dislocation can be treated in the same way. The authors offer advice to help surgeons manage these patients. Anterior instability of the glenohumeral joint is a common clinical entity. While recognizing and treating the acute presentation of a dislocation or subluxation is a fairly straightforward exercise, managing that patient to prevent future episodes of instability requires a thorough understanding of the patient and his or her injury. In short, not every anterior shoulder dislocation can be managed in an identical fashion. Below are tips and tricks that can help improve the surgeon’s success in managing these patients. 1. Beware of patients who have a shortened arc of bipolar contact between the head and glenoid (glenoid fractures and Hill-Sachs lesions). Osseous lesions are known to be present in 89% of failed surgical stabilizations. Bone loss on the anterior glenoid rim greater than 15% to 20% of the surface should be considered for bony reconstruction or augmentation to restore the force needed for dislocation. [2,3] Hill-Sachs lesions greater than 30% of the head should also be addressed. Bone loss on the glenoid can be addressed with a coracoid transfer (for example, Bristow or Latarjet), a block of auto (iliac crest), or an allograft (distal tibia). The Latarjet procedure has had a surge in popularity as recent long-term follow-up studies have shown rates of recurrent instability of less the 6% at 20 years. Regardless of the source of the bone, the most important aspect of the procedure is restoration of the normal anatomic width of the glenoid. 2. Surgeons should be more aggressive in treating patients who are young, as well as contact athletes. 4. Watch out for rotator cuff tears secondary to a dislocation in older patients. 5. 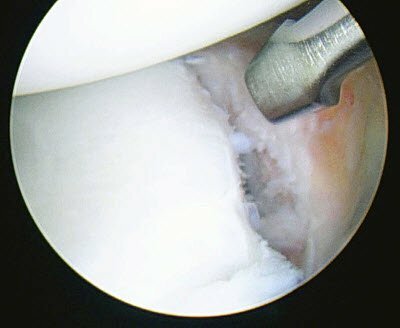 Patients with MDI respond poorly to isolated arthroscopic instability repairs. These patients often do not have a characteristic Bankart lesion at arthroscopy. While a capsular plication can be performed, the incidence of clinical failure is much greater in this patient population than in traumatic unidirectional instability patients. Instead, prolonged physical therapy directed at the rotator cuff, deltoid, and scapular stabilizers are the standard of care. Without reconstruction of concavity-compression created by addressing capsule, ligament and labrum, recurrent instability is much more likely (Figure 1). Figure 1. A suture passer is used to capture the labrum and the redundant capsule. Both layers are incorporated into the repair. 7. In subacute and chronic cases, it is critical to release the scarred labrum and capsule from its position along the glenoid neck and allow it to float back to its anatomic location before fixation. The “bumper” must be placed on the rim or surface of the glenoid, as that dictates the amount of force needed for dislocation (Figure 2). Repair in a more medial position is unlikely to restore stability. Figure 2. 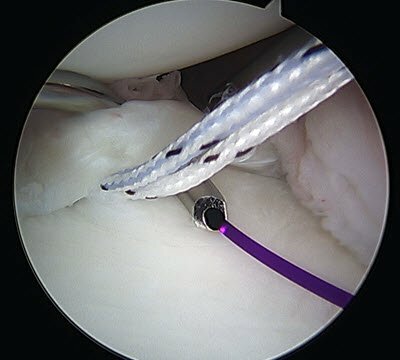 The arthroscopic labral elevator is used medially along the neck of the glenoid to free any scar and allow the labrum to float back to its anatomic position. 8. Recurrent instability after a repair, especially from a non-traumatic event, should be considered for open treatment. 9. There are few good indications for an arthrodesis in patients with anterior instability. However, an arthrodesis may be considered in patients with an axillary nerve palsy resulting in a flaccid deltoid and uncontrollable glenohumeral instability. These patients are exceedingly rare, not generally considered part and parcel of traumatic unidirectional instability. For younger or high-demand patients, reconstruction of the Hill-Sachs lesion with an osteoarticular allograft is often a superior choice. Addressing the underlying cause of shoulder instability is essential for successful outcomes in these patients. Finally, if there are irreparable tears of the cuff encountered at the time of arthroplasty, especially of the subscapularis, a reverse total shoulder may be a more appropriate implant choice as it is a semi constrained prosthesis. The management of anterior shoulder instability requires the treating surgeon to uncover the underlying causes of the instability and address them systematically. For many patients, closed reduction and early mobilization are adequate to restore shoulder function. However, if the patient is young, a high-demand contact athlete, or has either a bony lesion of the glenoid rim or a large lesion of the humeral head, additional interventions are often necessary to avoid future instability events. Mark A. Schrumpf, MD, and Tom R. Norris, MD, are orthopaedic surgeons practicing at California Pacific Medical Center, San Francisco, California. They specialize in shoulder and elbow surgery. Burkhart SS, De Beer JF. Traumatic glenohumeral bone defects and their relationship to failure of arthroscopic Bankart repairs: significance of the inverted-pear glenoid and the humeral engaging Hill-Sachs lesion. Arthroscopy. 2000 Oct;16(7): 677-94. Yamamoto N, Muraki T, Sperling JW, Steinmann SP, Cofield RH, Itoi E, An KN. Stabilizing mechanism in bone-grafting of a large glenoid defect. J Bone Joint Surg Am. 2010 Sep 1;92(11):2059-66. Hovelius L, Augustini BG, Fredin H, Johansson O, Norlin R, Thorling J. Primary anterior dislocation of the shoulder in young patients. A ten-year prospective study. J Bone Joint Surg Am. 1996 Nov;78(11):1677-84. Taylor DC, Arciero RA. Pathologic changes associated with shoulder dislocations. Arthroscopic and physical examination findings in first-time, traumatic anterior dislocations. Am J Sports Med. 1997 May-Jun;25(3):306-11. Waterman BR, Burns TC, McCriskin B, Kilcoyne K, Cameron KL, Owens BD. Outcomes after Bankart repair in a military population: predictors for surgical revision and long-term disability. Arthroscopy. 2014 Feb;30(2):172-7. Neviaser RJ, Neviaser TJ, Neviaser JS. Anterior dislocation of the shoulder and rotator cuff rupture. Clin Orthop Relat Res. 1993 Jun;(291):103-6. Neer CS 2nd, Foster CR. Inferior capsular shift for involuntary inferior and multidirectional instability of the shoulder. A preliminary report. J Bone Joint Surg Am. 1980 Sep;62(6):897-908. Yamamoto N1, Muraki T, Sperling JW, Steinmann SP, Itoi E, Cofield RH, An KN., Does the “bumper” created during Bankart repair contribute to shoulder stability, JSES 2013 Jun;22(6) 823-34.